Oldtoys is completely correct...it's mostly the lighter colored plastic and the gold color. If you need any help at all with them...repair, identify etc...feel free to hit me up. 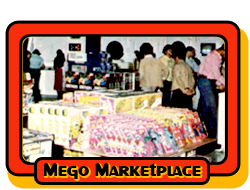 I was an avid collector of that line and am currently cutting down to just mego. If you'd be interested, I still have some items I plan on selling off, but I'd trade for some if the megos I'm after as well.